GEORGE’S SHOULDER: Paul George is nursing a sore right shoulder and is considered day-to-day for Sunday’s game. 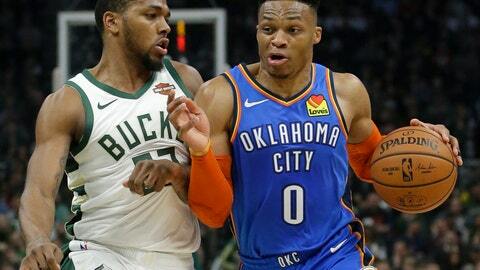 The All-Star forward missed the Thunder’ regular-season finale Wednesday at Milwaukee because of the nagging injury, which also kept him out of games on Feb. 28, March 2 and March 3. He hit a winning 3-pointer on Tuesday against Houston but aggravated his shoulder. “It’s playoff time, so it’s more than this, it’s about being out there with my guys. As much as I can get it 100 as possible or close to it, expect me to be out there on Sunday,” George said. CJ’S READY: McCollum missed 10 games with a left knee strain and had only played in two games since returning. But he said he’s ready to put in a full shift. NO NURK: The Blazers’ hopes for success in the playoffs were dealt a blow last month when Nurkic was lost for the season with a broken left leg. Nurkic was averaging 15.6 points and 10.4 rebounds when he sustained the gruesome injury during a game against the Brooklyn Nets. Fans were so upset about the loss of the 7-footer known as the “Bosnian Beast” they chipped in for a billboard in Portland that proclaims “We Love You Jusuf Nurkic” in English and his native tongue.